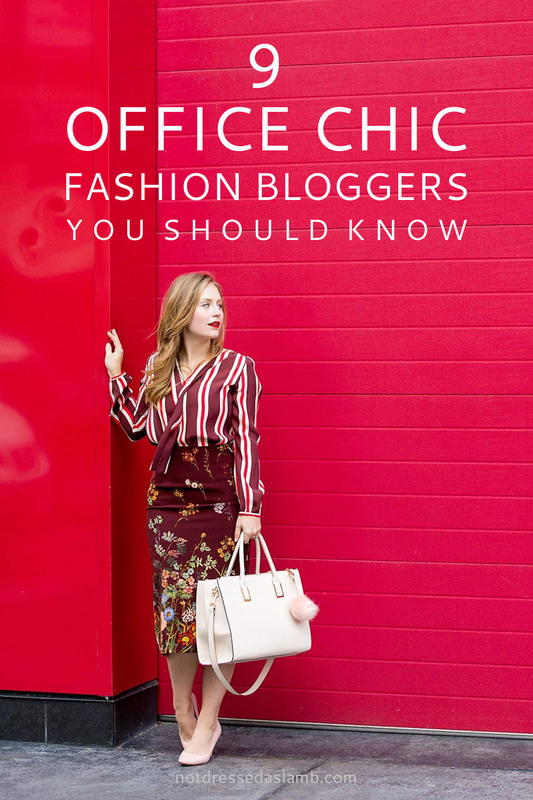 Today I’m all over workwear with office chic fashion bloggers in my latest featured fashion bloggers series! Although I don’t any more, I did work in an office for many, many years and enjoyed the challenge of dressing ‘properly’ every day. Of course now I’m working from home I can get away with jeans and sweatshirts – I somewhat miss dressing up that much now! The dress code at my old office was incredibly relaxed – as we didn’t meet the public or clients (not often, anyway) we could get away with wearing almost anything, as long as we avoided the aforementioned slouchy combo. I may not need to dress for the office anymore, but I still like to take inspiration from bloggers who are absolutely nailing workwear – in this post I’ve featured some bloggers whose niche is office chic, and others that wear all sorts but either feature workwear regularly, or simply have a style that would be suited to an office environment. Many of the featured outfits would be perfect for corporate environments and others are more appropriate for creative workplaces – but with the odd tweak here and there I’m sure there’ll be a ton of inspiration for you if you need to amp up your office wardrobe. SOME OUTFITS WOULD BE PERFECT FOR CORPORATE ENVIRONMENTS AND OTHERS ARE MORE APPROPRIATE FOR CREATIVE WORKPLACES – BUT WITH THE ODD TWEAK HERE AND THERE I’M SURE THERE’LL BE A TON OF INSPIRATION FOR YOU. 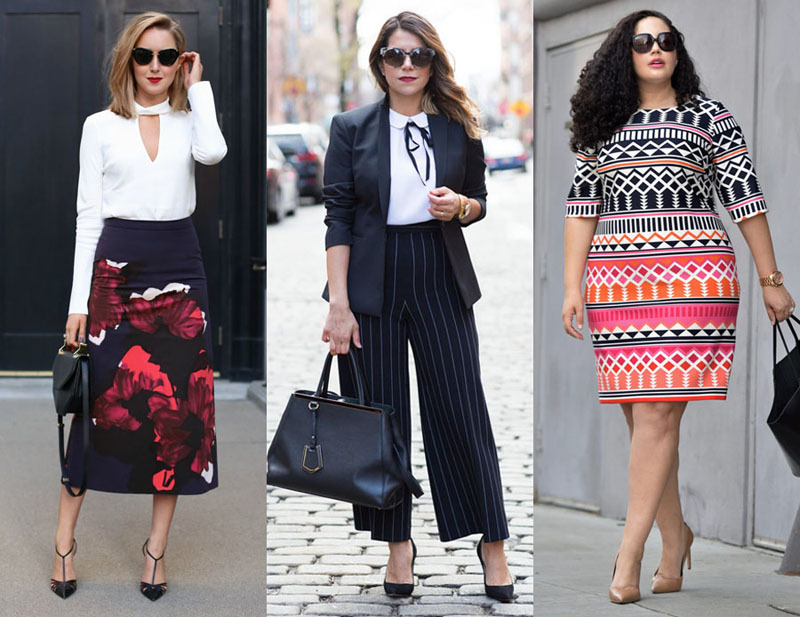 Whether you work in an office or not, I can guarantee you’ll still love the amazing style of these lovely ladies – let me know your thoughts! For me personally, Ashley’s wardrobe is to-die-for – I’d be as happy as a pig in [blank] choosing what to wear for the office from her wardrobe every day. She has a talent for monochromatic looks and feminine pieces with a lot of skirts and dresses in stunning fabrics and gorgeous colours. Plus, if you want to know how to accessorise your workwear outfits to make them 10 times more stylish, look no further than Ashley’s beautiful OOTDs. 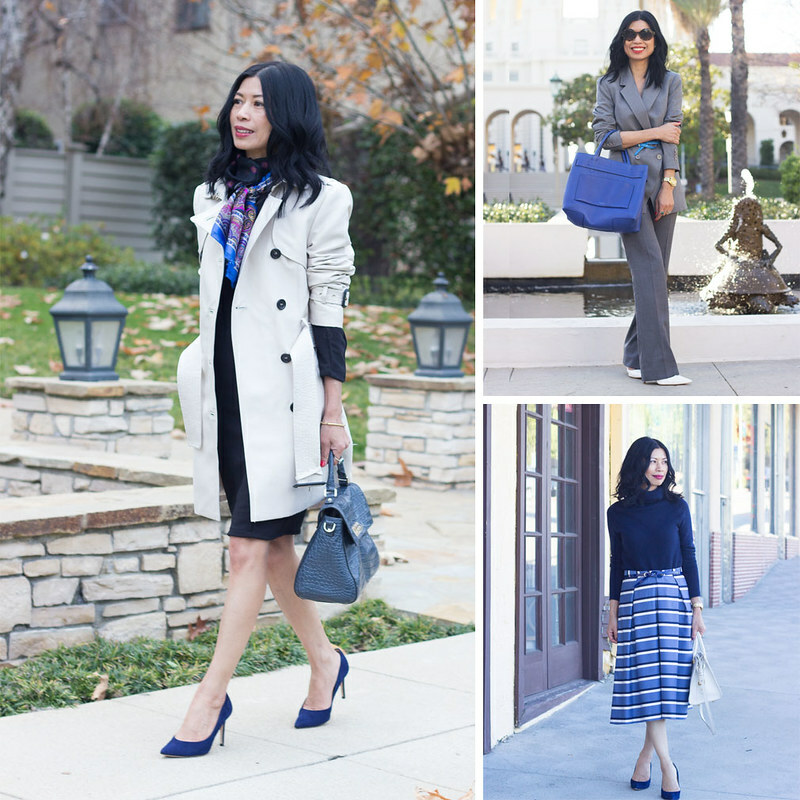 Anh is one of the first bloggers I can remember following, not least because the name of her blog meant I knew I was going to get lots of ideas for what to wear to work. She favours soft tailoring and smart casual looks in neutrals, soft blush colours and black styled in a very classy, effortless way. I probably could have made the whole post about Mary’s wardrobe – she’s the Queen of Office Chic. She even has categories on her blog for styles for different office types (conservative, creative and casual), as well as interview attire, day-to-night and special occasion. Phew. The pieces she wears are high quality and she favours a lot of tailoring, though she’s not afraid to wear florals and soft pinks, making them look as office appropriate as a sharp suit. Her blog is the No.1 stop for workwear inspiration. If you want to wear a riot of colour to the office, then you have to follow Folake and her incredible style. She takes typically conservative combinations of blouses and pencil skirts and translates them into an explosion of colour and pattern – sunshine yellow and emerald green or tangerine orange and teal are typical colour combinations. Plus she has the most banging body I’ve ever seen – that tiny waist is a sight to behold. Another blog that does what it says on the tin, Olivia features a ton of sharp, dressy looks based around a muted palette of black, white, cream and navy. She has a great eye for detail and her outfits are subtly but beautifully accessorised with killer heels, fabulous totes and neck scarves or ties. Janise has a knack of wearing office appropriate outfits and making them look very soft and feminine. She’s quite a classic dresser but always throws in some interesting textures, patterns or colours into the mix. A great blog for everyday office wear inspiration that’s easy to emulate. Tanesha’s style is a little less formal but still super smart and office-worthy. She doesn’t favour trousers over skirts or vice-versa – she looks as gorgeous in a patterned shift dress as she does in a full 50s skirt or a smart-blouse-and-pants combo. You’ll find a ton of layering inspiration and Dress Down Friday ideas in her outfit posts. If you work in a creative environment or your dress code is very casual, then Ro’s blog is a great go-to for relaxed workwear inspiration. She’s great at layering and putting together interesting combinations – she’s not afraid to wear contrasting textures or subtle patterns. In a nutshell I’d describe her style as “artistic comfortable cool”, a style that (almost) makes me want to work in an office again. Last but not least: Krystal, who’s been blogging since the early days. I’ve included her as you may not have thought to go to her blog for workwear inspiration. She leans towards the creative, but with a lot of midi skirts and tailored trousers her wardrobe would be ideal for offices with relaxed dress codes. HAVE YOU FOUND ANY NEW-TO-YOU BLOGGERS THAT YOU’RE NOW OBSESSING OVER? (I HOPE YOU HAVE!) TELL ME IN THE COMMENTS…! Thank you very much for these girls sharing with us! I’ve already started following a few of them. I love fashion and everything connected with it! Thank you for sharing an informative blog. Visit StalkBuyLove for the latest styles and trends of clothing. I like crystal tomorrow pattern best. Collection is very beautiful and unique. I quite agree, Jodie!! And aren’t these bloggers amazing, as you quite rightly said…! Awesome outfits. I have learned a lot about official outfits. Thanks for sharing. Fabulous posts, these 9 new up and coming bloggers are chic, and interesting. Keep posting great content. I am brand new to your page, and I am excited to see what information you will share with your followers. That’s an interesting article about outfits, thanks for the great share Catherine. As a business traveller, I felt that a good tailored outfit makes me more confident to approach, I like the portion you mentioned about choosing appropriate colour. And I do like your other article. Keep up the good work. The dresses are looks so trendy and nice collections. Wow, outfits are awesome and you are also looking fabulous in these outfits. Finding this post is like… finding your tribe! I can't tell you how excited I am to have stumbled upon this post even though I've been following you on IG for a while! I have to admit there are 2 bloggers on this list I didn't know.. but everyone else I've followed for YEARS especially Memorandum and Corporate Catwalk! I am friends with Janise from IG and have done a loop giveaway with her from before. Love love love this list! Once day I hope to be featured along side these established super fashionistas! Wow, outfits are awesome and you are also looking fabulous in these outfits. I have seen same sort of dresses on Myntra, one should by the same using Myntra offers. Catherine, I'm so happy to see my friend Ashley featured here! Her style is such an inspiration! And what's more, you've turned me on to SO MANY other great bloggers! Thank you for doing these round ups. Just when I think I've discovered every talented blogger out there, you refresh the scene! The sweater dress looks fab. The fall of the dress is perfect. Wow! Thank-you for hunting out and introducing me to some ageless and awesome style icons! Great selection, Catherine! I love them all. I've followed Style Pantry for ages but lots of the others are new to me. I used to adore getting dressed to go to a big corporate office every day, and I still miss it a little now, but like Suzy said, I DON'T miss office politics! There is nothing like clicking along a corridor in a pair of heels and a killer suit. Love the clothes featured…but 90% of the shoes have very high, very spiky heels. Is that realistic for the over 40 worker? These aren't ideas for women in their 40s or over, Susie – they're for women of *all* ages… No discrimination here! I wear spiky heels and I'm 44…! Not all older women can't wear high heels – some young girls don't /can't wear them. The idea isn't to copy these outfits exactly – as I mentioned in the post "with the odd tweak here and there I'm sure there'll be a ton of inspiration for you"… Emphasis being on tweak! Lovely ladies, I love Ashley of SedBona! Thank you so much for the feature, Catherine. Some of these bloggers I didn't know existed 'till now. I have to check them out!!! These women are clearly at the top of the style charts. They all look incredible – I wish I could pull off colour the way Folake does. She looks AMAZING! I adore Folake's style too, Suzy – puts my colour combinations to shame!! 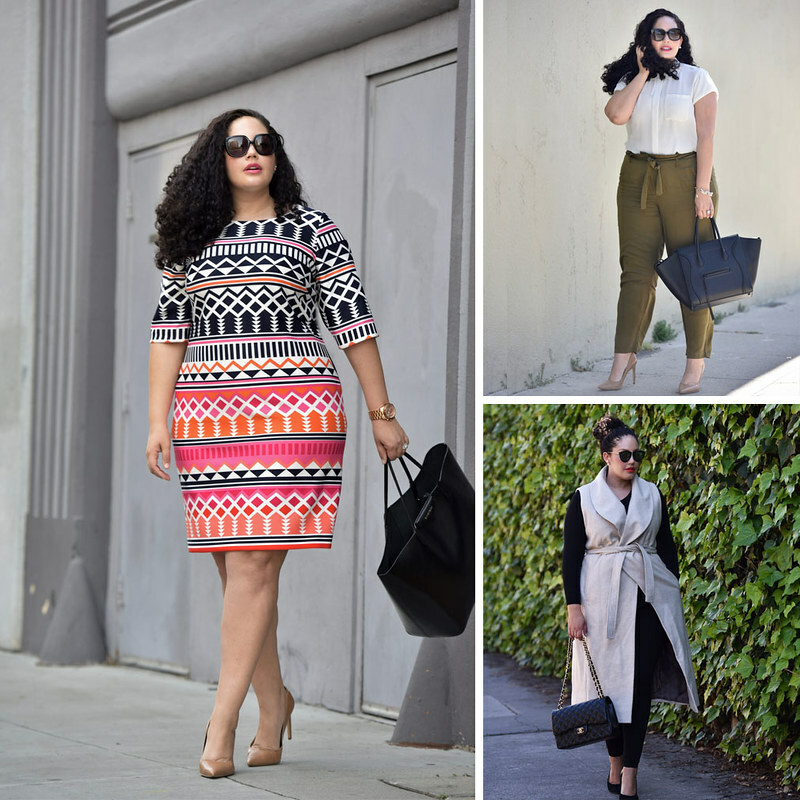 I follow some of these fab office chic ladies and glad to have some new names to follow! Catherine I am beyond humbled to be featured — especially with such compliments on my closet and with so many bloggers I personally admire! Know that if you're ever visiting Chicago you ALWAYS have access to to my wardrobe! Of all the bloggers I've met since starting on this journey, you have been by far my very favorite. Somehow you must have known I was having a rough day today too — you've given me such a mood boost today with this post! You have no idea!! What a great list Catherine! I, too, am not in the office anymore, but I'm a firm believer that one should still dress up professionally. Especially when you go to a professional office (as a client or patient)—even though you don't work there, it's respectful to dress the part!! I quite agree, Jodie!! And aren't these bloggers amazing, as you quite rightly said…!